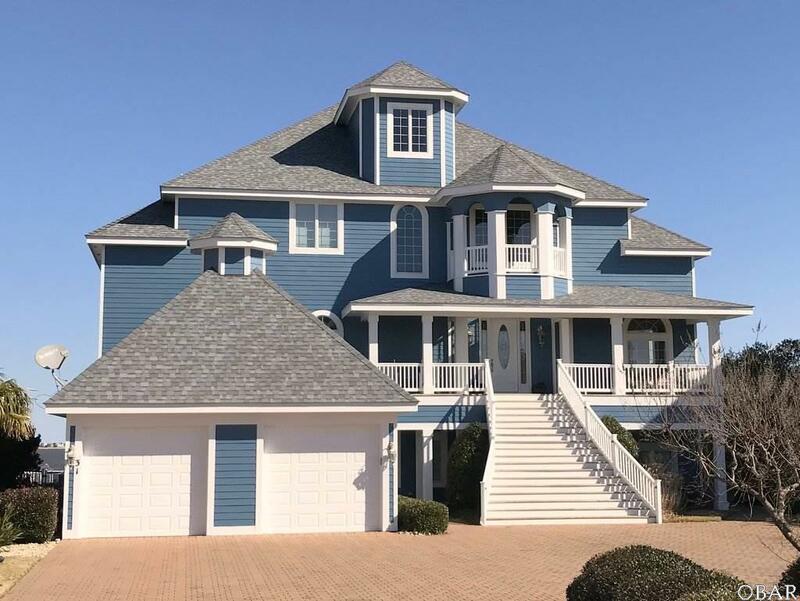 31 Ballast Point Drive, Manteo, NC.| MLS# 101541 | Outer Banks Homes For Sale, North Carolina Home Search Including Nags Head, Pirates Cove, Manteo, Kill Devil Hills Kitty Hawk, Southern Shores, Duck, and Corolla North Carolina, Oceanfront and Soundfront properties for sale and long term rentals. Gorgeous soundfront home! Located in the Ballast Point subdivision of Pirate's Cove, this 8BR, 7BA 2 partial bath home was designed to showcase the 180 degree water views and features soaring ceilings, gourmet kitchen, dining room with separate breakfast nook, two master suites, roomy den/office, a lower level game room and family room, wine cellar, entertainment loft, and bi-level decks that overlook the heated pool, hot tub and NEW private pier with jet ski lift. SOLD FURNISHED, this potential investment property features Brazilian hardwood floors and spiral staircase, tumbled marble foyer, Thermador kitchen appliances, Monogram sub-zero refrigerator, granite countertops, ceramic tiled, walk-in showers, 4 gas fireplaces, ELEVATOR, two wet bars, two laundry rooms, a tackle room, outdoor shower, and 2 car garage with separate golf cart garage. In addition, a 35FT boat dock (slip 33) in the Ballast Point canal conveys to a qualified boat owner. Located in the gated community of Pirate's Cove, community amenities include two swimming pools, tennis courts, clubhouse, renovated fitness center, playground, commons area, world-class fishing marina, on-site restaurant and 4 miles of perimeter docking perfect for walking or fishing. NEW roof installed in Oct. 2018 & NEW EXTERIOR PAINT in 2019.